Communicating data visually is not only about perception and precision, but also understanding. ISOTYPE was developed to bridge the gap between showing data in a way that’s easy to read and at the same time easier to understand than unadorned bar charts. The International System of Typographic Picture Education (which is what ISOTYPE stands for) was developed in the 1920s by Otto Neurath, his wife Marie Neurath, and Gerd Arntz. It came out of the philosophy of the Vienna Circle (think Freud, Wittgenstein, Schrödinger, etc. ), with the goal of changing the world by educating people about the world around them (see The Changing Goals of Data Visualization). ISOTYPE is really a larger system, which includes two ideas that nicely complement each other: a visual language for creating icons, and the idea of using multiples to represent quantitative data. The visual language is the better-known one. If you have seen traffic signs, public restroom signs, or any kind sign really, in the last 80 years or so, you have seen either ISOTYPE designs or designs strongly influenced by ISOTYPE. The icon language is based on ideas like the extreme restriction of angles and shapes used, only using two colors, symmetry, etc. What is less known is that these icons were not only used for signage, but also to construct visualizations of data that were meant to educate people about the world. The icons make these images easier to read and remember, because the visualizations themselves contain hints to their subject matter. 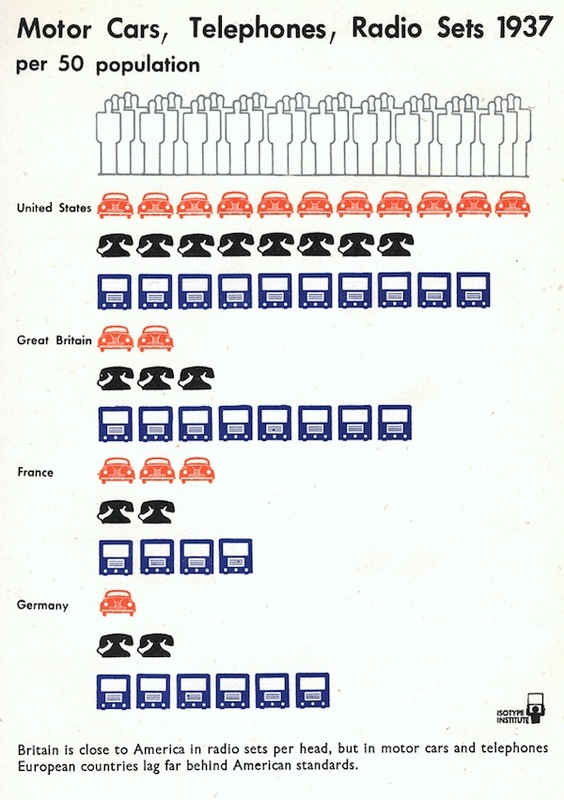 The following example compares the numbers of cars, phones, and radios in four different countries in 1937. What could be more obvious than to use cars, phones, and radios to represent cars, phones, and radios? Icons typically represent multiples, though in this case each object represents just one, though in terms of how many per 50 people. Multiples are nice and all, but they can be hard to count and compare. Notice how the icons line up to create little bar charts, however, for easy direct comparison. Even the different object icons are of the same width, though comparison between them is of course not necessarily meaningful. Comparisons, like between countries, are one thing. 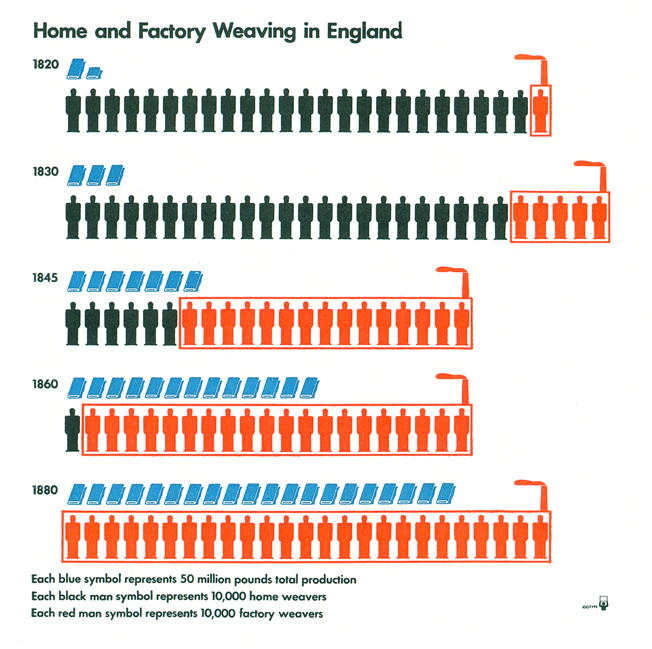 But ISOTYPE also lends itself to telling little stories, by showing a progression through time. The following example shows the change in employment during the industrial revolution in England. Here, each figure stands for a multiple, in this case 10,000, workers, and each bale of textiles represents 50 million pounds of product. Notice how the red factories (with the little smokestacks) are swallowing up the workers over the course of the 19th century. What is interesting is that the total number of workers stays roughly constant, while I would have expected more of a decline in employment. The amount of production increased dramatically, though. The ISOTYPE may be close to 100 years old, but many of the ideas behind it are still very relevant and visualization might benefit from considering some of them. The images used here, and many others from classic visualization texts, can be found in Michael Stoll’s wonderful flickr collections. I dislike multiple little icons for a reason you mention above: that they are invariably used to make an inferior sort of bar chart. Better to make a bar chart, and leave the icons to stand as a label, if you want to avoid using English words. I notice even in the examples they use English to name the countries, and Arabic numerals for the years. A little telephone is a nice alternative to the word “telephone”, but not essential (and how would you say “the latest iPhone”, or “GMO rice”? Hyphen Press here in the UK publish several beautiful books on the history and philosophy of Isotype , which you might be of interest.